The hike to Coast Guard Beach in Eastham on Cape Cod is spectacular and diverse. You walk through the woods on a wonderful little trail listening to all of the birds along the way and then along Nauset Marsh where you can see Great Blue Herons and Great White Egrets as well as many other birds. The hike takes you over a bridge in the marsh with breath-taking views of Nauset Marsh and then back through a little trail in the woods up to Coast Guard Station. From there you can walk along Coast Guard Beach which goes for miles, sit at a picnic table and enjoy a scenic picnic, relax on a bench and wallow in the beauty or turn around and head back. 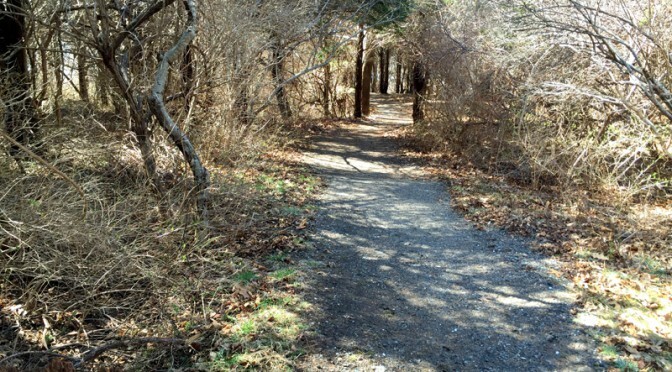 It is definitely one of my favorite hikes on Cape Cod! Not too long and just perfect! 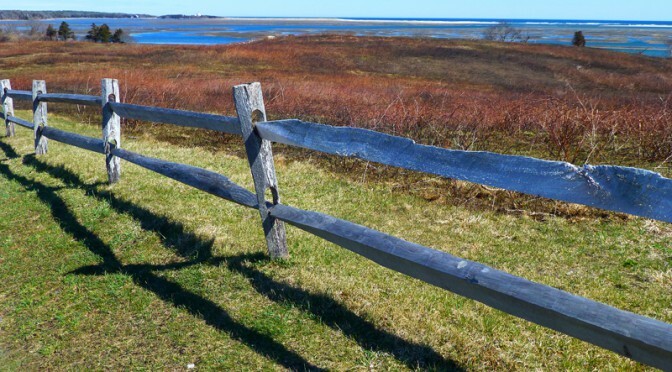 The views on Cape Cod don’t get much better than the view overlooking Nauset Marsh in Eastham. This was a gorgeous day with the tides high. You can see the Coast Guard Station in the distance on the left and Nauset Break in the distance to the right. If you have never been to Fort Hill, put it on your to-do list! We were taking a little hike down to Coast Guard Beach along Nauset Marsh on Cape Cod when I saw my favorite bird out in the tall grass. 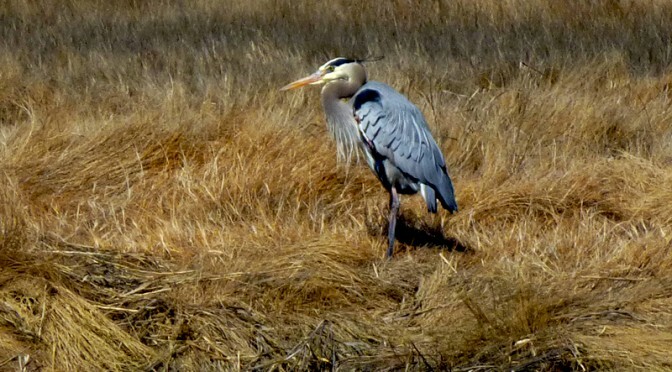 This Great Blue Heron was standing there, pruning himself. Look at those feathers… just beautiful! On our way back he was moving around and you could tell he was looking for a meal in the little tributaries coming out from Nauset Marsh. The wind was up and the waves were good for Stand Up Paddleboard Surfing at Coast Guard Beach in Eastham on Cape Cod. 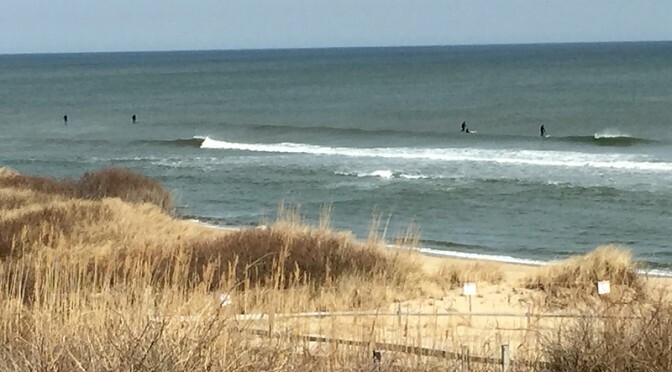 This surfer was taking advantage of the beautiful weather that we had in December. 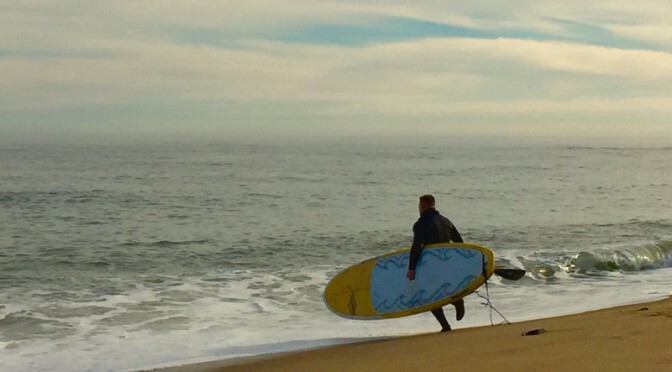 Cape Cod Stand Up Paddleboard Surfing is growing in popularity as more and more people experience the pure adrenaline rush of being propelled by the sheer power of ocean waves. 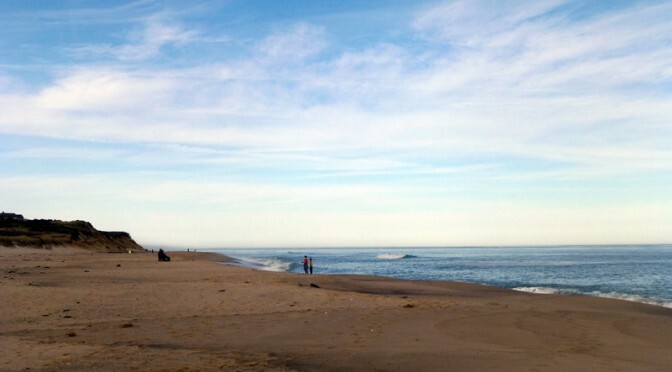 And Coast Guard Beach is one of the favorite beaches on the Outer Cape to get out that paddleboard and enjoy that rush, any time of the year. We took advantage of many gorgeous winter days to walk along the beaches in Cape Cod, especially Coast Guard Beach which has been rated as one of the top 10 beaches in the world! Henry David Thoreau, in his book Cape Cod, named Coast Guard ‘The Great Beach’. A fitting name as the beach seems to go on forever sharing sands with other famous names such as Marconi and Nauset. This was a perfect day for a walk on Coast Guard Beach! The temperatures were in the 60s and just glorious!